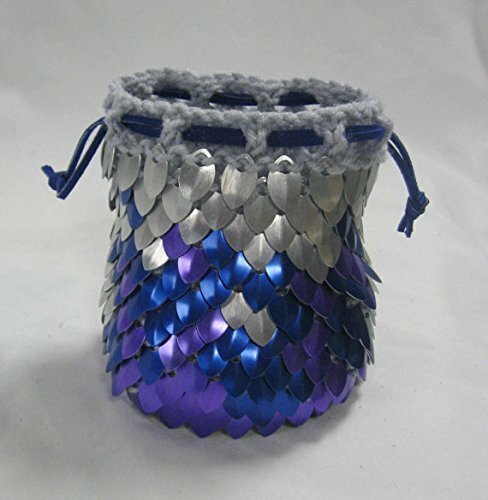 Cold fire of blue and purple flare across the shiny silver background of this dragon scale dice bag. Use it to hold your dice or any other small treasures. The outside of the bag looks like scalemaille, but the inside is knitted pale grey acrylic yarn and won't scratch your dice. The design is stretchy should you make a good haul and need a little more room. The dice in the picture are NOT included. This bag features a flat circular crocheted base 3.5" in diameter, reinforced with plastic to hold its shape. The bottom won't droop when you lift it full of dice. The circular sides rise 6" high. This bag will easily hold over a hundred dice. You can see all the dice I poured in it in the last picture. Even with all those dice it closed easily with double blue leather drawstrings for fast and secure closure. I'm happy to take custom orders. More of my ready to ship Dragonhide is in this section: http://amzn.to/2b6t5Uh or contact me for a custom order. Care instructions: This bag is hand washable, just remove the leather laces and plastic liner first. Wash in cold and lay flat to dry. If you have any questions about this product by Crystal's Idyll, contact us by completing and submitting the form below. If you are looking for a specif part number, please include it with your message. Scalemail Dice Bag in knitted Dragonhide Armor- Bronze Forest - Small 3.5"x3.5"